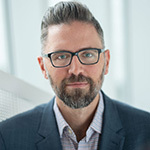 Olivier Doucet is an associate professor at HEC Montréal and the academic supervisor for the organizational development option in the MSc program. He has led seminars on performance management for HR managers and professionals in several different countries. He has also advised various businesses and organizations on setting up or updating evaluation tools and performance management programs. He currently teaches and coordinates courses in performance management at the undergraduate and graduate level. Research focuses include the supervisor-employee relationship, leadership and performance management.